Thermal is finished! Yesterday morning I finished up the ribbing and pulled it triumphantly over my head (yes, it can be done)! 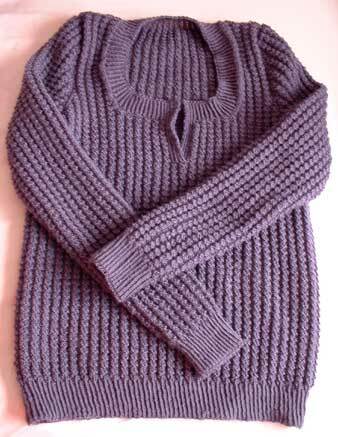 There were some fiddly bits to do towards the end, such as setting in the sleeves and sewing the plackets down, but overall this was a very straight-forward knit. My ribbing around the neckline is a little longer than called for but I prefer it. I also added a third buttonhole at the top of the placket because I like things to line up properly (and I would probably have an obsessive-compulsive meltdown since all good buttons come in odd numbers). You may notice from the photo that although I have buttonholes, I have no buttons… yet. I will add them over the weekend and when I return to Galway (I am en route to Dublin via Sligo), I’ll enlist the help of a local guy with a fancy camera to take some better FO shots. Since I finished Thermal early yesterday, I needed a new project to take the edge off during the bus journey to Sligo. What could be better than a hat? Derm is Alb’s younger brother. Last summer, I bought a peruvian hat at the Electric Picnic for a tenner. Every time I wore it down to Galway after that, Derm would regularly sigh and say, I’d love a hat like that. Since I am quite fond of the hat, I eventually offered to knit him one but because it involved colourwork, I kept putting it off. Anyway, this week we found out that Derm not only got a first in his degree, but came first in his class too. 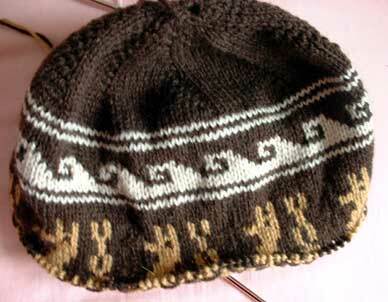 What better reason to knit a hat? Once the llamas are finished (or dogs, according to my mum… dogs with interesting tails), I’ll add ear flaps with a scroll design. I’m going to add an extra layer to the inside of the ear flaps because on my hat, they are too thin and flap about in the wind. This extra layer, which I think I will extend right up to the inner band of the hat, will include his name and mobile number. Derm likes to party and, for a guy who once lost his phone in a canoe in the middle of a field but managed to find it the next day, such details may not be a bad idea! Stay tuned for more dogs. As suspected, the year is finally catching up on me. Although I made a good start on new music yesterday, most of the afternoon was spent dead asleep and the evening was given over to recovery knitting (anyone else watch Rocky IV on sky one?? attrocious). First order of business was to graft the toe of my first Monkey. I was going to cast on for the second one straight away but I was distracted by the so-close-and-yet-so-far Thermal. Last night, I finished the back, which involved some interesting short row shaping for the shoulders. I have nearly completed the left front. Hopefully I will get the entire front finished today and get started on the ribbed border. I’ve been hoping to get out and get some photography going but the weather has been horrible. Today doesn’t look like it will shape up much better. That said, it’s nice to be away even though I still have work to do. Speaking of which… I’d better get started! Although things have been quiet here, everything else in my life has been hectic. Sorry. Did I say hectic? I meant, the equivalent of a mutinous zoo. All last week was taken up with the Music Network course. It was a blast and I got so much out of it but it didn’t leave any time for anything else. On Friday evening, I turned right around and started packing to move to Galway. Packing up and moving isn’t such a big deal, but when you’ve got an electric piano to dismantle and move, it is! Most of Saturday afternoon was taken up with figuring out how to take it apart and, once it was apart, how to get it to fit in the car. The piano is big and heavy but still very delicate and fiddly. This morning we had the joy of putting it together (ever feel the need to torment an engineer? Buy an electric piano and insist it be moved. Then insist that a childhood spent playing with Meccano was more beneficial than one spent playing with Lego… it was phillipshead to phillipshead!). This is where the sock comes in. Consider this the perfect antidote to ‘move it your way!’ ‘no! you move it your way!’. 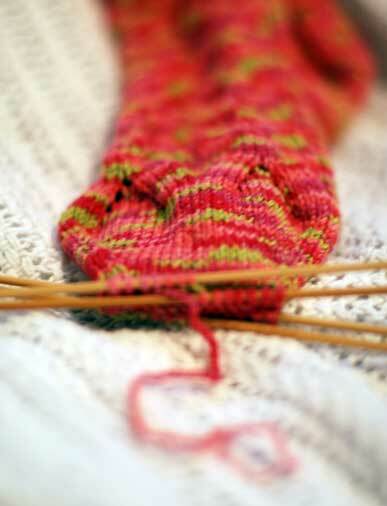 I am one round away from grafting the toes together but I ran out of yarn (this is how tired I am. I will happily walk away tonight from a set of ungrafted toes). Maybe it’s the crumpled-clothes-from-a-binbag talking but the nearly finished sock has a distinct serpentine appearance. Get back to your ssssssweaterssss! More news tomorrow about Thermal, the AirShow we saw today and what it’s like to live in a place that’s not Dublin! This week I am partaking in a course run by the Music Network of Ireland called Making Overtures. The course is a week of seminars, four per day, all about how best to promote yourself. So far it has been very interesting. I have been bringing along some emergency knitting but haven’t needed it yet! In fact, I have had very little time for it since we started yesterday. That said, though, you can’t keep a good knit down. I swore to Lisa that I would finish my Cashsilk top on Sunday… I did, actually. Sort of. I worked the back first and left shoulder stitches sitting on some waste yarn. 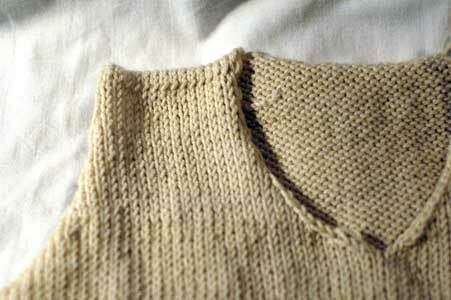 Then I worked the V-neck at the same time as the armhole shaping, and grafted the shoulders together. If you look, you can see the little line of stitches where I grafted them. It’s not that noticeable when it is on. I am glad, in a way, that I rushed through this because it taught me a number of things. Firstly, I should have calculated my armhole shaping more accurately. I could do some tugging and get away with it but when it comes to writing a pattern for other knitters, that’s not good enough. I would hate to get that far in a project and have crummy armholes. Wouldn’t you? 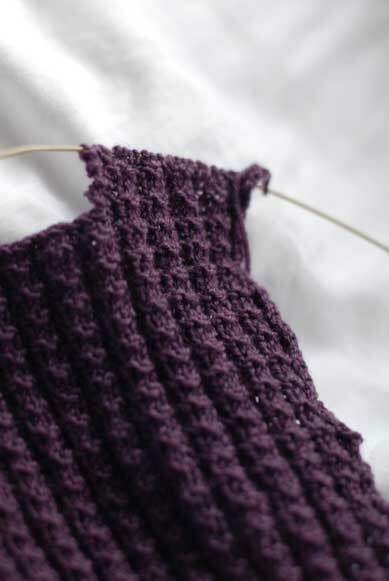 Secondly, I should have started the V-neck about three inches lower, just after I started the armhole shaping. Oh well! I’ll just rip it out and knit it again. Thermal has been getting a look in, too, although I can’t remember when. More sleep knitting perhaps? The nice thing about shaping the sleeve cap is that it gets smaller so the last bit goes really quickly! That’s the plan anyway. 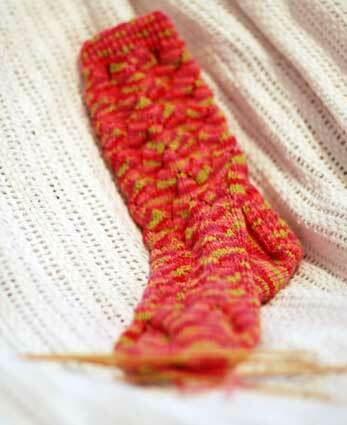 My emergency knitting for the course has been a pair of Monkey socks. Now. Look. I didn’t mean to cast on for a pair of socks. I have two sweaters to finish by the end of the week, right? But I can’t help being sorely tempted by the fantastic summer colours of the Crystal Palace colours… and the necessity for something small and discrete should I desperately need to knit during a dull speaker. Worldly events contrive against my knitting. (This is the Party manifesto. 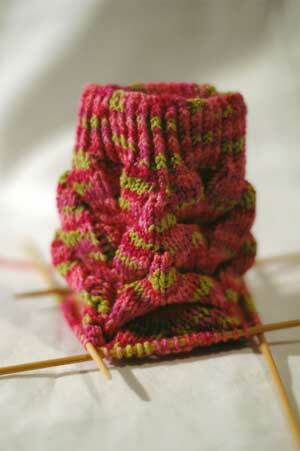 Secretly I believe the world is contriving totally for my knitting because these socks are great fun! What a pattern! If you feel the same but fear the wrath of the Party (eg. haven’t you got yarn just like that already? why are you knitting a pair of socks instead of finishing a sweater? 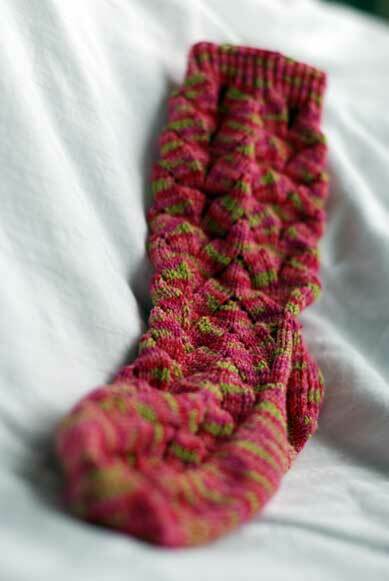 ), join me in some secret seminar knitting or call 1-800-NEED-2-KNIT). I have lived in Dublin for six years and I’ve noticed that everybody has a personal relationship with Dublin Bus. They do great things, they do bad things. They’re on time, they don’t show up. They change routes, they extend routes. Personally, I love Dublin Bus because I benefit from their more random routes. Just this year they introduced a completely new route – the number 4 – running from Ballymun to Vincent’s Hospital. This meant that as well as the lottery system of catching the 13 into college, I also had the very regular 4 that I could depend on. Only last week Dublin Bus extended this route so that the bus now runs into Blackrock village. Guess what’s in Blackrock! What a bizarre route! … but I now have a bus that goes from my house, all the way across town, to my local yarn shop. Fabulous! Yesterday I taught my first class out at This is Knit. Billed as a Simple Summer Shrug class, I figured I could offer my Rosy shrug and a simpler shrug, based on the same construction. As it turned out, all three of my students plumped for Rosy. None of them had worked with Kidsilk Haze before. 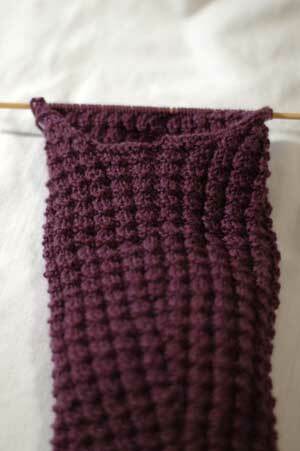 I taught everyone how to do a crochet provisional cast on (eventually….after a total memory blank!! don’t ask me! I’m just the teacher!). Lisa showed Carole and I showed Charlene how to use the Magic Loop technique. The class was lots and lots of fun. There was much drinking of tea, discussion of Turkish carpets, Electric Picnic, the new Addi Lace needles, yarns, green knitting… you get the idea! There will be a Part II class next Saturday, but if you missed this week’s class, you can still come along and join in. 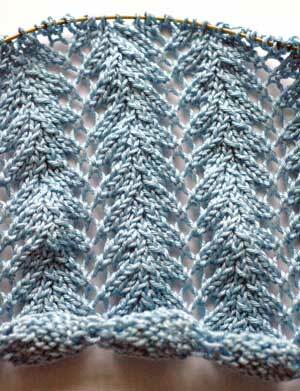 If you’re not feeling up for a lace shrug, the simpler shrug is perfect for some mindless summer knitting. You pick the yarn of your choice and I’ll show you how to plug in the numbers for a perfect shrug! 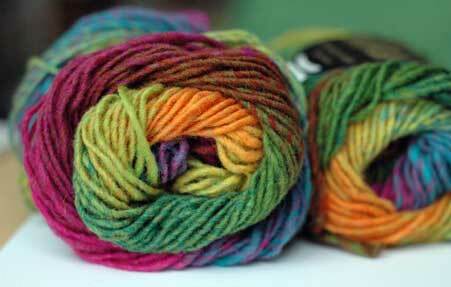 So, when I heard that Noro Kureyon 154 has been discontinued, I begged Lisa to keep me her last two balls of it. They are destined for one of my 10 summer sweaters. I’m going to make a plain black sweater with a circular yoke – a jumper with no obvious seams between the sleeves and the body. On the yoke, I’m going to put in some fair isle patterns, but I’m going to cheat and use the Kureyon instead of using a million different colours. Not such a bad idea, eh? 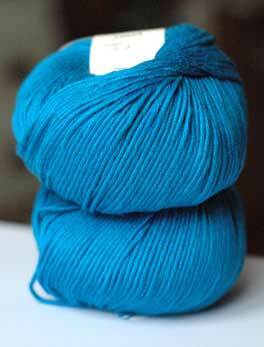 I also swapped my Debbie Bliss Cathay, which was a pale blue, for a better colour – true blue! What a colour! I have been sort of tired these days. I was tidying things up and found that my Orangina was longer than I remember it being, so I took a picture. I must be sleep knitting. I wish I’d do more of it!